The United States of America's oldest public park, Boston Common was purchased by its citizens in 1634 for 30 Pounds and officially set aside as public or "common" land by a vote in 1640. The park's original purpose was for military training grounds and a place for grazing cattle. Just prior to the Revolution, "Sons of Liberty" or early dissenters of British rule, were said to have adorned the "Great Elm" with lanterns to symbolize unity. The Great Elm, known as Boston's "oldest inhabitant" for many years, was destroyed during a huge storm in 1876. After independence was gained, criminals were hanged upon the limbs of this great tree (Quakers were hanged at Boston Neck). Boston Common has its place in military history. British troops gathered there in 1758 before the 2nd Battle of Louisbourg, Nova Scotia, during the French and Indian War. Soldiers were recruited there in 1759, just before the decisive second Siege of Quebec. In the American Revolution, Boston Common had trenches, artillery, and a powder house. British forces assembled there before the Battle of Lexington and Concord in 1775, and also before the Battle of Bunker Hill. About 1,700 "Red Coats" spent the winter of 1775-76 at the Common in preparation for a possible attack by George Washington. During the American Civil War, Governor Andrew gave inspiring speeches to the troops at the Common before sending them to the southern fronts. In modern times, Boston Common is used for recreation. It's a place to escape from the bustle of the city. There are several "malls," or broad walkways, where people stroll to relax and get a little exercise. Occasionally, one may see a political protest or a voting drive at Boston's downtown "centerpiece." A famous duel took place on the Common in 1728. Central Burying Ground, dating from 1756, is located at Boylston & Tremont Streets on the Common. The site of the Liberty Tree, is also just one block from the southeast corner of the Common not far from the cemetery entrance. 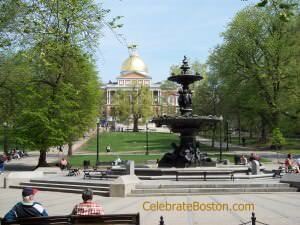 The beautiful Brewer Fountain is located at Park and Tremont Streets, within the grounds of the Common. The Soldiers & Sailors Monument and Sub Chasers Memorial stand on the hill overlooking the Frog Pond. A marker associated with the first organized football club in America is also located on the Beacon Street walkway (on the small walkway opposite the Founders Monument).